Opera For Children: "Who Stole B Flat?" 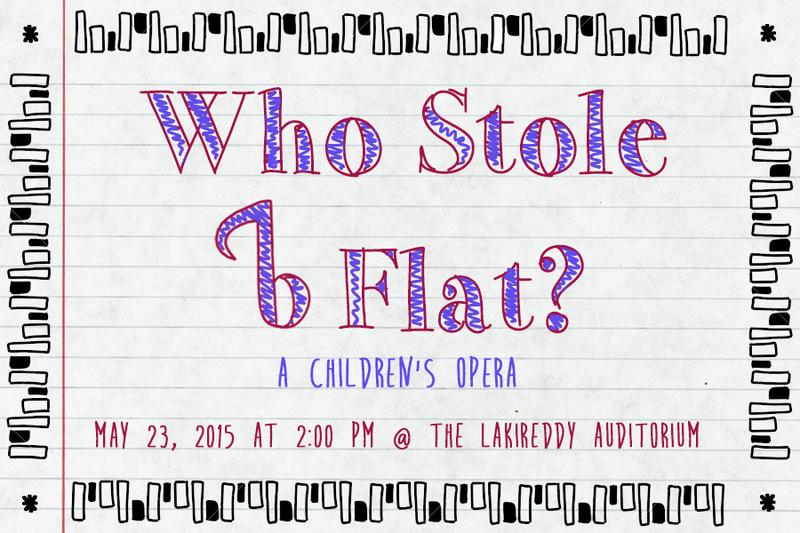 Home › Events › Opera For Children: "Who Stole B Flat?" "Who Stole B-Flat?" An original story full of mystery, beauty, and hilarious interactive-fun, will be performed for schoolchildren and the general public at UC Merced as part of an effort to expose Merced County youth to opera and theater. Approximately 3,000 area schoolchildren will attend twice-daily school performances between May 18th and May 22nd. These performances are offered to schools free of cost and will be held in Lakireddy Auditorium at UC Merced. In addition, a public performance is scheduled for May 23rd at 2:00 pm in Lakireddy Auditorium for the community to enjoy. Suggested donations for the public performance are $5 for adults and $3 for children. Parking is free. The opera is written by Nancy Steele Brokaw, and uses music by Wolfgang Amadeus Mozart, Giacomo Puccini and Arthur Sullivan. This particular presentation of “Who Stole B-flat?” marks its West Coast premier after an initial production in Illinois last spring. The opera features professional opera singers Shawnette Saulker as Princess Aria and Jonathan Smucker as Prince Forte, along with Modesto College music student, Uriah Brown as Count Pizzicato and UC Merced student, Karlyn Rahmgren as Prince Poco Pants. The project is sponsored by the Merced County Office of Education, Arts UC Merced Presents, the Betty Scalice Foundation and private donations. Jenni Samuelson, lecturer for the Global Arts Studies Program at UC Merced, is directing and co-producing the opera along with Assistant Professor at UC Merced, Dr. Katherine Steele Brokaw and Arts UC Merced Presents producing manager, Gail Benedict. Philip J. Smallwood is the music director.